The James and Sarah Kirkpatrick home was designed by George Nelson and Gordon Chadwick, and is located in Kalamazoo, Michigan. The house was completed in 1958. It was restored to its original beauty by David Corner who spent ten years restoring it in every detail and furnished it with his collection of vintage modern furniture. The home is a rectangular, two-story, wood and steel-frame structure of gray corrugated metal and painted wood. The horizontal pull of the house is striking as it extends out toward the street on its beautiful natural lot. Exterior walls of panel and glass, rise two stories to the deeply overhung flat roof. There is a strong connection between indoors and outdoors. Nelson and Chadwick created a light filled modern masterpiece. The roomy main-floor includes living, dining room and kitchen with interior brick walls. The upper level, set back on two sides features bedrooms and recreation room. A small flat-roofed wing provides a recessed entry. The Kirkpatrick home is close to the Frank Lloyd Wright Parkwyn Village neighborhood of Usonian homes designed for a group of chemists from the Upjohn Company. 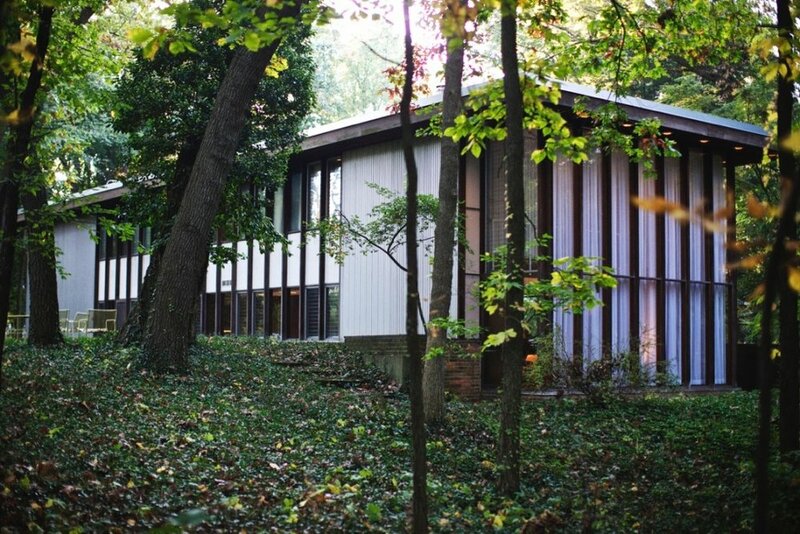 But this is no Usonian house. The Kirkpatrick house is more closely aligned with the Ray and Charles Eames house in the Pacific Palisades area near Los Angeles, California.